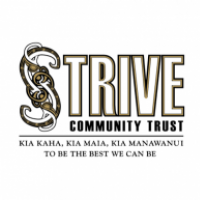 STRIVE Community Trust (formerly Tamaki Ki Raro Trust) is committed to providing services that collectively address the social, economic, educational and cultural needs of all people that reside in our rohe. The trust has delivered a range of education, training, social services and employment opportunities in the community since 1986 and has earned the respect and confidence of whanau, community organisations and government agencies alike. Today STRIVE Community Trust has a 'high trust' contracting status with the Ministry of Social Development, is a registered and accredited training provider with NZQA and has a preferred provider status with the Department of Child Youth and Family.